Corvus Energy powers the world’s first electric commercial fishing vessel. 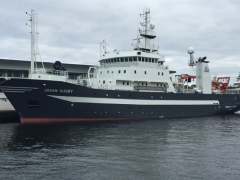 A Corvus lithium polymer Energy Storage System (ESS) has been integrated with a Siemens propulsion system aboard the world’s first electric commercial fishing vessel designed and built by Selfa Arctic AS. August 20, 2015 – Richmond, BC – Corvus Energy is pleased to announce a Corvus ESS with a Siemens BlueDrive PlusC marine propulsion system will power the Selfa Elmax 1099 electric fishing boat. The 11 metre electric vessel will have a 195 kWh ESS consisting of 30 Corvus AT6500 lithium polymer battery modules. The fishing boat, designed to operate entirely on Corvus battery power over a planned ten hour working day, will also have a small 50kW auxiliary generator and can be charged overnight by plugging into the electrical grid. Norwegian fishing company Øra AS will operate the first Selfa Elmax 1099 designed by Norwegian shipbuilder Selfa Arctic AS. The electric vessel to be named “Karoline” will be commissioned in Trondheim Norway this August and will be presented to the country’s Minister of Fisheries, Elisabeth Aspaker, in the same month. The Karoline will then be tested in the demanding conditions off the coast of Tjeldsundet in Northern Norway. In September, the boat will be moved to Tromso Norway to be part of the daily operations of Øra AS. While fishing the vessel will operate emissions free, eliminating all greenhouse gasses including CO2. The boat will also generate less noise and vibration than a standard diesel engine powered fishing vessel. “We have been working on this electric boat design for some time and Corvus batteries are part of the design solution. Their innovative battery technology enables the vessel to meet the needed performance specifications, that is, to operate electrically for a full fishing day.” Said Erik Ianssen, Selfa Arctic AS President & CEO. “With successful sea trials completed we are planning serial production of the vessel.” “Siemens is an industry leader in the development of environmentally friendly propulsion technologies. For smaller vessels such as the Selfa Elmax, we have developed BlueDrive PlusC, an extremely flexible, compact and high-capacity electric hybrid propulsion system which is designed to provide maximum efficiency. When integrated with a Corvus lithium ESS we can nearly eliminate all emissions making for one of the greenest fishing boats on the water today” Said Ole Johan Hungnes, Sales Manager, Siemens Marine. “We are very pleased to be part of this new and exciting development in fishing vessel design. Our ‘marine-hardened’ battery technology is a good fit for the groundbreaking electric drive Selfa Elmax,” said Andrew Morden, President and CEO, Corvus Energy. Corvus Energy makes the only lithium ion ESS Type-Approved by Lloyds, DNV and ABS. For more than 130 years, Siemens Naval & Commercial Vessels has been delivering electrical products, systems, solutions, and services for the efficient and reliable operation of commercial and naval vessels over their entire lifecycle. Our pioneering innovations in commercial and naval markets as well as our environmental portfolio open up new perspectives for our customers. Started in 1987, Selfa Arctic AS is based in Harstad, on the Norwegian coast and is a leader in the market for coastal fishing vessels under 15 metres. The company has two branches in Trondheim, and specializes in building vessels with lengths between 9.5 and 12 metres (32 and 40 ft). The firm’s flagship vessel is an 11-metre (36 ft) fishing boat set up to be operated by a single fisherman.